A United Launch Alliance Atlas 5 rocket carrying the Air Force's DMSP-19 military weather satellite lifts off from Space Launch Complex-3 at Vandenberg Air Force Base, Calif., on April 3, 2014. 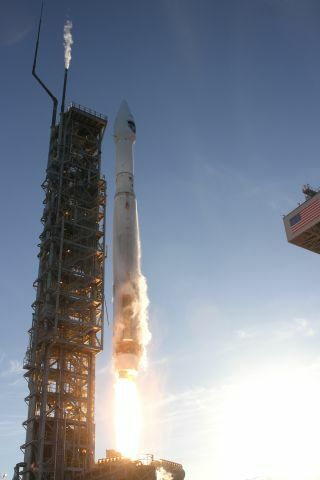 A new global weather observatory for the U.S. armed forces was lofted into orbit aboard its Atlas 5 booster rocket from California on Thursday to provide tactical forecasts to military operations. Powering away from Vandenberg Air Force Base at 7:46 a.m. local (10:46 a.m. EDT; 1446 GMT), the liftoff was timed to deliver the Defense Meteorological Satellite Program Flight 19 spacecraft into its precise orbit 530 miles high. "This new asset will carry on the mission for military users and civilians who depend on it." About 18 minutes into flight, the 2,700-pound satellite separated from the Centaur upper stage, marking the 115th successful Atlas launch in a row over the past two decades. "DMSP Flight 19 will provide data to identify, locate and determine the intensity severe weather such as thunderstorms, hurricanes and typhoons, and is used to form three-dimensional cloud analyses, which form the basis for computer forecast models needed to meet unique DOD requirements," said Col. Scott Larrimore, Air Force weather program director. "DMSP Flight 19 continues the legacy of over 50 years of providing meteorological data to the armed forces worldwide." The $518 million observatory will be checked out and ready for service in about two months, and joins a half-dozen older DMSPs in orbit divided into two orbital groupings. "F19 is placed into an orbit compromised between the two planes we currently have. We are changing our operational concept from this two-plane constellation to this single-plane constellation. We can do that because we can get data to the Air Force Weather Agency faster than before," Larrimore said. The craft carries a sophisticated suite of weather instruments to observe virtually the entire planet twice daily. Data from DMSP satellites is used to create global weather forecasts that military commanders and strategic planners rely upon. The satellites can track weather systems by visible and infrared cloud-cover imagery, day and night, plus monitor ice and snow coverage, pollution and fires. The primary sensor, one of seven aboard, is the Operational Linescan Sensor, which collects visible and infrared cloud pictures in 1,800-mile swaths covering the globe. The microwave sounder provides storm intensity measurements. "Weather is the vital element of well-planned missions for each branch of service. High winds limit aircraft, storms threaten ships and low visibility can alter troop movements. The data that DMSP provides is essential to mission success," said Stretch. What comes later is not quite clear. DMSP F20 remains on the ground, but officials may elect to keep it there in favor of moving on to the next-generation of a smaller spacecraft. "We certainly hope they launch it. It's built, paid for, it's a capable satellite, and we know it works, so we think that's the smart decision for the Air Force," said Mark Valerio, vice president of Lockheed Martin's military space division. "You have to find a balance because if you launch too early you might waste the on-orbit life, and if you wait too long then you run into the cost of storing it on the ground." "What happens after that is under review, but we're confident we're in a good place," said Gen. William Shelton, commander of Space Command. "Following the analysis of alternatives, we have gone on with a weather system follow-on program, which will end up being a small satellite which has unique DoD requirements satisfied. We will count on NOAA, international partners, and commercial [providers] to provide the rest of the data that's needed to round out the picture." Next for the Atlas program, attention returns to the East Coast and another try at launching the NROL-67 mission as early as April 10. That flight and a SpaceX resupply mission to the International Space Station planned for late March both were delayed due to a Range radar outage. The next space launch from Vandenberg will be the return of the Delta 2 rocket on July 1 with NASA's Orbiting Carbon Observatory 2. Another Atlas 5 will carry the commercial Earth-imaging spacecraft into orbit in August. You can follow Spaceflight Now on Twitter @SpaceflightNow and on Facebook. Copyright 2013 SpaceflightNow.com, all rights reserved.